With US equities continuing to slip across the day, the VIX built rather significant gains, settling +13.0% @ 13.69. 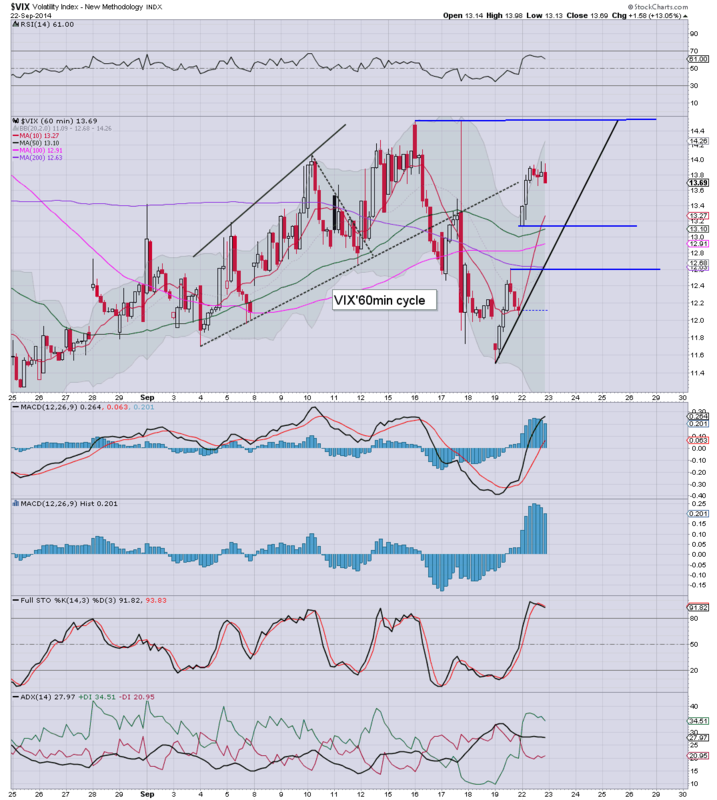 However, with the broader equity upward trend still intact, the VIX is set to remain within the 14/10 zone for some weeks to come. So... the VIX climbed.. but we're not even in the mid teens. Equity bears need to be especially mindful to keep today's jump in volatility in perspective. The broader trend in the VIX continues to be a series of lower spike-highs. US equities saw some notable weakness, with the sp'500 settling -16pts @1994. The two leaders - Trans/R2K, closed by a significant -1.4% and -1.5% respectively. Near term outlook is for rising support @ 1990 to hold, with renewed upside. A somewhat tiresome start to the week, not least for those who were holding long across the weekend. Certainly, paired with the Friday drop, this is the biggest 2 day decline since early August. Yet.. in the scheme of things... since we were breaking new historic highs a mere one trading day ago, equity bears really need to keep things in perspective. The broader trend remains to the upside. US equities remain very weak, with significant declines of -1.2% and -1.4% for the Trans/R2K respectively. 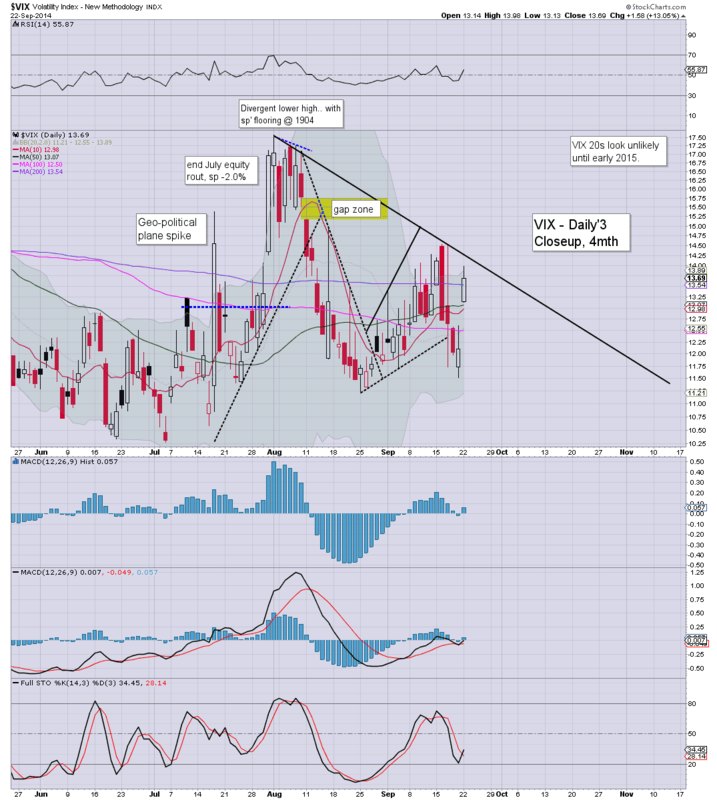 VIX is holding gains of around 14%, but is so far unable to attract interest into the 14s. Clearly, another attempt at a floor is underway, with a somewhat spiky candle on the hourly chart. Unquestionably though, today has been a day for the equity bears, especially in terms of the two market leaders - Trans/R2K, the latter of which has seen a death cross, and is getting some mainstream attention. Overall, I can't take the declines that seriously. Key support is currently rising trend @ 1990. 3.10pm.. Despite the metals largely flat.. .there is notable weakness in the miners. GDX -2.6%... absolutely dire on every cycle. Coal miners are equally dire, with ACI, ANR, and WLT all now in the $2s... incredible. 3.25pm.. sp'1990 holding... just. 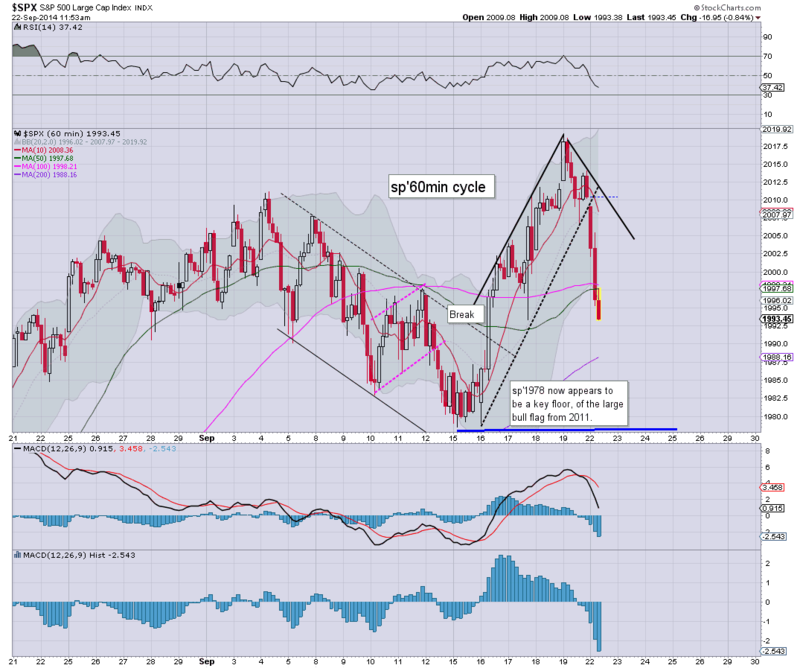 Its pretty important, won't take much of an overnight gap lower to take it out.. and that opens up last weeks 1978 low. If that fails...then... something new is going on. Interesting to see how rattled the cheer leaders are on clown finance TV are today. One day down day after Friday's new highs.... they sure do get upset easily. 3.43pm.. Bears being short-stopped out... 1995... and rising. With $1.7bn of QE tomorrow... bears face the usual problem. Best guess.. we close Tuesday 2005/10. 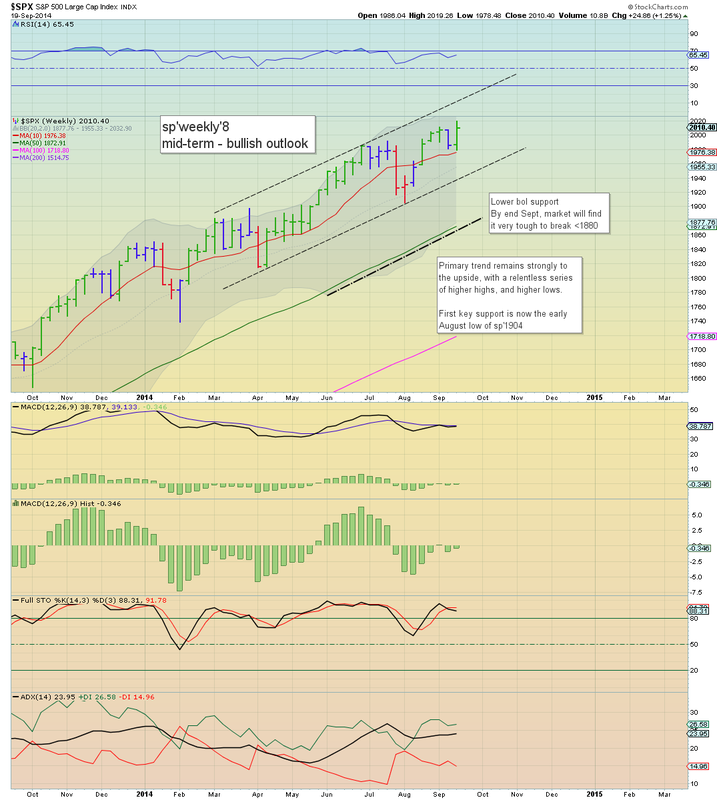 The issue then is... new highs by end week...or a lower high? 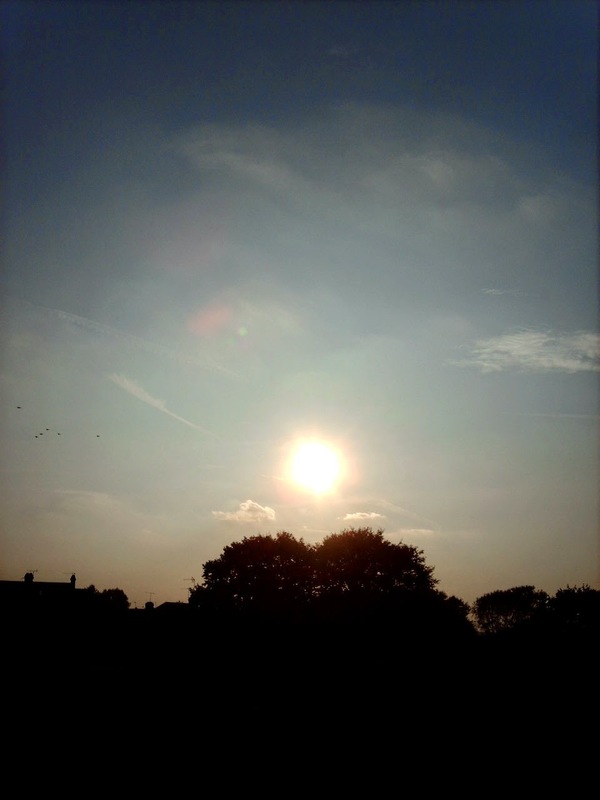 Considering the broader outlook... I still gotta think we're headed higher. US equities remain weak, and are significantly below the Friday morning high of sp'2019. No doubt, many of the weaker bulls got washed out today, and Mr Market has likely drawn in a few bear chasers on the downside. Regardless... primary trend remains UP. As for the market.. bulls just need to hold sp'1990... although yes, other indexes - notably, the R2K look a real mess right now. All things considered, nothing has changed in the bigger picture, but I'm sure many (not least the maniacs on zerohedge) will be proclaiming the Alibaba IPO marked a key multi-year top. Notable weakness: TSLA -4.8%, BABA -4.0%. 2.28pm.. so much for the floor. I suppose some will be calling this a micro 5th lower, but whatever you want to call it, its not a great start to the week for those broadly long. Equity bears have managed a surprisingly sharp down wave, the best since early August. VIX is reflecting this Monday mini-washout, +14%, but still only in the 13s. Even the mid teens look difficult to hit right now. First things first... clearly, we're still falling, ZERO sign of a turn. Those currently short, should at least be tightening stops to some degree.... after all... most could at least agree that the primary trend remains to the upside. Next key level is 1990, which links the rising trend from 1904.
Notable weakness: momo stocks, miners.. even the BABA is -4%. 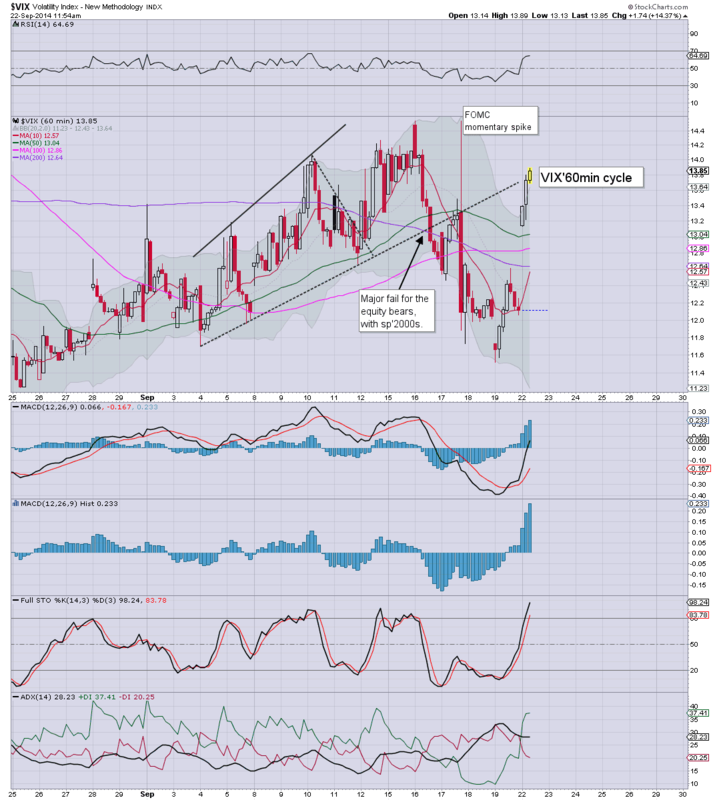 Hourly VIX/equity cycles are levelling out....looks like sp'1990s will hold. I hope those short across the weekend enjoyed today.. it is very likely the highlight of the week. So...moderate declines to start the week.. but hey.. its a long day ahead..and there is little reason why we won't see at least some degree of latter day recovery. First key support is the 2000/1995 zone. Under no near term outlook are we likely going under there. Notable early weakness: BABA -2%, but still holding the $90s. *I remain long, (naturally underwater, urghh)... but seeking the sp'2030s as a primary target by end month. Good morning. Futures are moderately lower, sp -5pts, we're set to open at 2005. Metals are mixed, Gold -$1, whilst Silver is down another -0.8%. 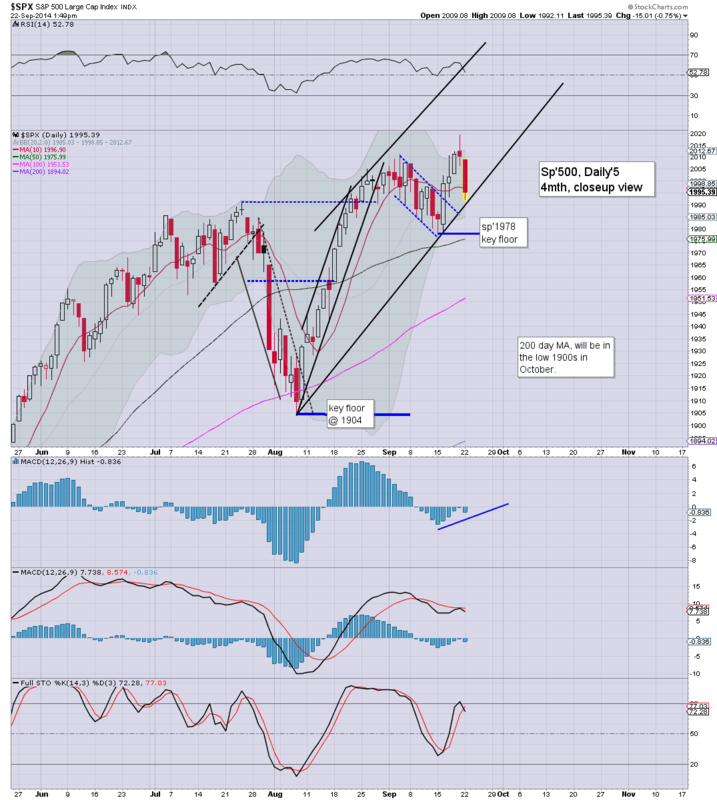 Equity bulls still look on track for the sp'2030s by end month. So, we're set to open lower, but well above the earlier overnight lows. Frankly, Morgan is almost as crazy as Organ (the latter of which was touting $200 silver by year end)... make of the above...what you will.